Collision course: Marvin Krasnansky says plans to increase seating at Sears Point Raceway to accommodate 110,000 fans is a potential disaster for Sonoma. 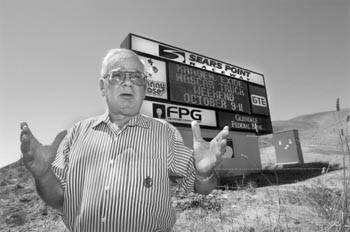 ASK SONOMA Valley resident Marvin Krasnansky about the proposed $30 million expansion of Sears Point Raceway and this outspoken critic is more than happy to oblige: "I'm concerned about the total impact--the traffic, the noise, and what's at stake for the future of Sonoma Valley, and what we leave our children and grandchildren. This is a critical period. "Do we really want this to become racetrack haven?" Spurred by the growing popularity of NASCAR races, the North Carolina-based raceway owners initially wanted to spend $30 million to increase seating capacity from 25,000 to 110,000, and create a huge new grandstand 110 feet high and nearly two thirds of a mile long. However, after a public uproar, they came up with a revised plan that proposes reducing the height of the grandstand to 75 feet and making other cosmetic changes to "camouflage" the facility. Krasnansky, who describes himself as a former "pushy New Yorker," is co-chair of the Sears Point Yellow Flag Alliance, a recently formed non-profit group of about 80 residents who says they're "committed to preserving Sonoma Valley's quality of life." The draft environmental impact report on the controversial project was released in the spring, and the public comment period ended in July. The final EIR will be released in the next few weeks and then will go to the county Board of Zoning Adjustments. But the Yellow Flag Alliance has slammed the draft EIR, saying it contains many faults. The group is worried that the proposed major expansion will lead to massive gridlock on Highway 37, endanger the environment with noise and air pollution, degrade wetlands and scenic open space, and open Sonoma County to irreversible commercial development. The Sonoma Valley Citizens Advisory Commission, an agency appointed by the city of Sonoma and the county Board of Supervisors, also unanimously rejected the EIR as "inadequate and incomplete." In fact, Krasnansky is so concerned, he did something about it that stirred up the debate even more. Last month, the retired public-relations executive rattled investors on Wall Street by paying a news service to distribute a press release on the Internet claiming that the county could shut down Sears Point because of noise violations. The statement contained written comments from Rachel Sater, an attorney hired by the Yellow Flag Alliance, with Brandt-Hawley and Zoia, a Glen Ellen-based firm specializing in environmental law. In her July 30 written comments, Sater told the BZA, "The EIR must disclose mitigation measures that would bring the raceway under existing and projected conditions into compliance with the county's noise code. ... The EIR fails to explain that noise levels associated with current operations violate the Raceway's current use permit." Internet providers then electronically cross-referenced the press release with the company's stock information. The Speedway stock reportedly fell by almost $1.50 a share at that time, but it is unknown whether the press release caused the tumble. KRASNANSKY is unrepentant about the high-tech tactic, but Sears Point president Steve Page, who had to field calls from shaken portfolio managers and investors, criticizes the move. "It was impossible to say what effect it had on stock prices, but it did raise concern," he says. "What worries me was the tactic itself. This is an open public process, and there is a right way to go about it." The information in the release was misleading, he adds, noting that the race track is not in danger of closing. Indeed, he says that Sonoma County has no noise ordinance. "The general plan lays out certain standards recommended for business and various land uses," he explains. "Our use permit was modified in 1992 and incorporates a sound study that explicitly says Sears Point Raceway occasionally achieves noise levels in excess of county standards. To say we're in violation of the use permit is incorrect." Sonoma County officials have acknowledged that the race track sometimes exceeds noise standards. However, there is no action pending against the facility and no citations have been issued in the past. Meanwhile, the two sides have spelled out their positions in dueling ads, which have recently run in the Sonoma Index-Tribune. Sears Point officials say the proposed upgrades are intended to improve traffic management and reduce current congestion. But the Yellow Flag Alliance is asking county government to scale back the proposed seating capacity by 60 percent. The group is urging the BZA and the county Board of Supervisors to cut the proposed seating capacity to 44,500, reduce the frequency of large events--especially during the height of the tourist season--and limit the use of the facility to motor sports. The group claims the aggressive expansion is just the first lap in a long-term plan to accelerate Sears Point Raceway's growth. The group charges that, based on the track record of Sears Point's parent company at its four other raceways, "this grandiose expansion plan ... represents just the first step to increase the number of major events, attendance, and other development at Sears Point." SPEEDWAY Motorsports Inc. of Charlotte, N.C., a publicly owned company with a market value of $1.15 billion, purchased Sears Point in November 1996. SMI also operates racetracks and entertainment complexes in Charlotte, Atlanta, Fort Worth, and Bristol, Tenn. These facilities are used for concerts and auto shows, and include condominium developments, office towers, restaurants, and private clubs with year-round memberships. It's a scary scenario for critics residing in this scenic, semi-rural area, with its backdrop of vineyards and rolling hills, known as the "Gateway to the Wine Country." However, Page says there are no such plans for the 30-year-old Sonoma facility. "These allegations about potential rock concerts, etcetera, are not grounded in fact," he says. "There's no basis for this. Our use permit does not allow for it, and the statements are just intended to inflame and scare people." Krasnansky is not convinced. "They say they have no plans right now, but it gives them an awful lot of wiggle room," he complains. "They need to justify their investment with increased use." Page says the company has listened and responded to public input and will continue to do so, but the goal is to fix a sports facility that is "seriously substandard." He recognizes the battle ahead. "There's a group of people that just don't like the fact that there's a racetrack in southern Sonoma County and will not be accepting of anything we propose as long as Sears Point continues to exist," he says. "To them, somehow racing is an inappropriate [activity] for this area."